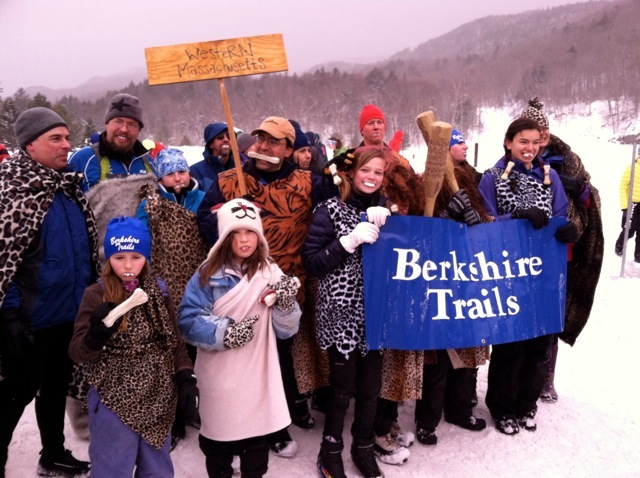 Berkshire Trails skiers racing at the Bill Koch Festival. The New England Bill Koch League believes that children should have the opportunity to have fun while learning to cross-country ski. The NEBKL believes in creating a safe and healthy environment where children can develop physically, psychologically and socially. All NEBKL activities and competitions are designed to teach each young athlete to participate to the best of his or her respective abilities. Opening ceremonies of the Bill Koch Festival. Members were dressed like cave men. The leader-teacher-coach/athlete relationship is a privileged one. The capacity for healthy growth and potential for joy are enormous. But it is equally true that there are few times in the life of young people when they are more vulnerable to disappointment, frustration, and feelings of inadequacy than when they are participating in sports. Children need to learn and perform in an encouraging environment. In the NEBKL we believe that skills are learned, not driven home. Attitudes are nurtured, not dictated. Club practice and club activities should be welcoming places. Everything we do as Leaders/Coaches/Teachers is underscored by the fundamental understanding that the vast majority of children learn by doing. Learning by doing is the primary teaching style of the NEBKL club.